Lily Lake (population 922) is located in northeastern Illinois about 15 miles east of Dekalb. The town sits in the central portion of Kane County on Illinois Route 47 just north of Illinois Route 64. Lily Lake also borders the town of St. Charles, about 3 miles to the southeast. http://en.wikipedia.org/wiki/Lily_Lake,_Illinois, the town of Lily Lake was established around a lake of the same name. The town was plotted along the Great Western Railroad for dairy farmers allowing them to ship their goods to the city of Chicago. The lake on which Lily Lake sat was drained in the 1930s to allow roadways to and from town to be built. Lily Lake was originally inhabited in as early as 1851 and was first known as Campton. The name was changed to Lily Lake in 1887. Schooling in the area was organized as early as 1841. It was in 1918 that the Lily Lake school district was formed. The Lily Lake school offered education for kids in grades 1 - 8. It also offered two years of high school education. Upon graduating from the two-year high school kids would often attend a nearby 4-year high school such as St. Charles, Elburn, or Plato. 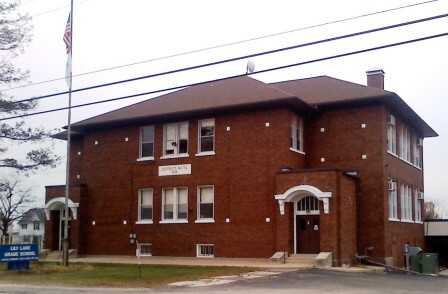 The Lily Lake school was the focus of the community. Annual "fairs" and other gatherings often brought residents of the area together. The article states that athletic contests were also held at the school. It was in the year 1950 that Lily Lake High School was officially closed. This was due to the abolishment of all 2 and 3-year high schools in Illinois. The district joined the newly formed Central School District located in Burlington. The Lily Lake School continues to serve the community as an elementary school (grades K - 5) for the Central School District. And shall wherever we go. At school, at work, and at play. Dear red school of mine! The Lily Lake High School Lions likely played high school basketball in Illinois High School history. We believe it is possible that the boys competed in baseball and possibly track as well. School team colors, team records, and coach's names are also items we would like to add to this page. We know that the Lily Lake High School experience did not rest soley in the gym or on the field. We believe that many other "extra-curricular" activities were offered as part of the educational plan too. FFA, FHA, GAA, band, chorus, and many other events probably helped to make the Lily Lake school a special one. Do You Have Information to Share About Lily Lake High?